Three amazing medicinal mushrooms﻿ you can collect & use all year round : a guest blog by Vicky Chown. Vicky was born and raised in London. She had a calling to study nature from a young age and didn’t let city living get in the way. She began foraging and growing food and medicine as a teenager in any green space she could find – local parks, wastelands, window boxes and back gardens. Her passion for herbs led her to work for Neal’s Yard Remedies for 7 years where she developed her extensive knowledge of herbal remedies and natural skin care. This led to teaching foraging and herbal remedy making and working on her own allotment and in an organic permaculture garden where she now grows many of the plants that are used by Handmade Apothecary, the company she set up with friend and colleague Kim Walker. She also supplies food for the Queen’s Wood Cafe and oversees a community of volunteers. “On medicinal mushroom forays people often ask ‘what makes a mushroom medicinal?’ In fact, pretty much all mushrooms are medicinal in some way, especially when you view your food as medicine. Even the common button mushroom contains some immune boosting polysaccharides. Medicinal mushrooms can be delicious edibles, for instance Hen of the Woods – Grifola frondosa is used as a gourmet mushroom in fancy restaurants but also as a tincture that you will find in many a herbalist’s apothecary. Other medicinal mushrooms, particularly some polypores (perennial bracket fungi that grows on trees) are too tough to eat but can be prepared in particular ways to extract their various medicinal qualities. These include decoctions, tinctures and powder reductions (outlined below). During the winter months it may seem like there is nothing to forage for out in the woods, but look a little closer and we find that nature provides just the thing for the cold and flu season; polypores. Here are three medicinal polypore mushrooms that can be found even throughout the depths of winter (they may even be considered ‘at their best’ between November and February) in the UK and other parts of the northern hemisphere. This blog is not intended for mushroom identification, be sure to get a good mushroom ID book such as Roger Phillips ‘Mushrooms’ and try to join some mushroom forays with a knowledgeable guide before trying to identify mushrooms in the wild. Birch Polypores are common and easy to spot, unsurprisingly they only grow on Birch trees, both living and dead. The fruit bodies of Birch Polypore start as a white, spherical mass and mature to have a grey/brown upper surface with a white underneath like a finely pored sponge, but the individual pores cannot be seen with the naked eye. These ‘fruits’ have a rubbery texture when fresh, when old and past it the get spongey/corky. It is best to pick Birch Polypores for medicine when they are still white and rubbery in texture as they get old, they flatten, becoming dryer, darker brown on the top and they are not at their best. Birch Polypore was found on ‘Ötzi the iceman’ the 5300 year old mummy found in the Italian Alps. Its ethnobotanic uses are wide and varied, from medicine to tinder to knife sharpener. This fungus is styptic, antiseptic and also contains anti inflammatory triterpene acids, making it great for minor skin abrasions. A very effective plaster can be made from Birch Polypore by peeling away a fine slice from the outer skin of the fungus and wrapping it around small cuts and grazes to stop bleeding and help with skin healing. 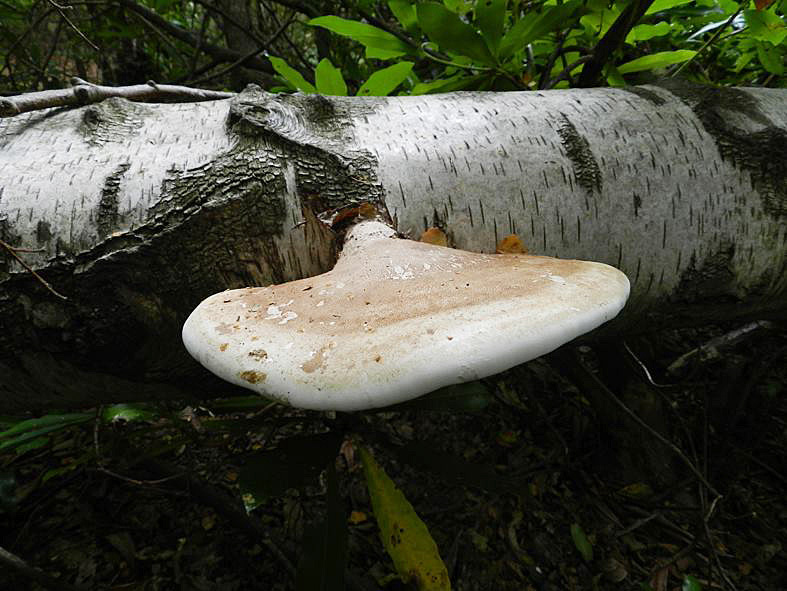 Birch Polypore contains polysaccharides, mostly glucans that are beneficial to immune health. A decoction made from this mushroom makes a great winter tonic for cold and flu season. It also has potential anti-cancer activity in a number of ways; its general immune-modulating and stimulating effects may help support the body during chemotherapy. Studies suggest it may inhibit the proliferation of cancer cell growth, tumour cell adhesion and angiogenesis – the process of formation of new blood cells that support tumour growth without negative effects on healthy cells (2,3). In nature, Birch Polypores grow only on Birch trees. The fungus sequesters betulinic acid from its host. Betulinic acid has shown some antiviral activity, even reducing the multiplication of the HIV virus (1). This beautiful fungus grows on dead hardwood logs in woodlands and pretty much anywhere there is decaying wood, occasionally on living trees. The concentric rings of colour on its cap can vary hugely but tend to stick to brown, buff, cream, orange and green, with an outer ring that is usually white or cream, resembling…you guessed it – a turkey’s tail feathers. It is 1-3mm thick. The pores on the underside are just visible to the naked eye. The cap surface has a beautifully tactile fine layer of fuzz or hair (when harvesting this mushroom, I often find a piece in my pocket that I’ve been stroking unconsciously all day). Like many medicinal mushrooms, Turkey Tail contains various polysaccharides, one in particular is polysaccharide K (PSK) which has been extracted and isolated from Turkey Tail. Preliminary research indicates that PSK has anticancer activity and may inhibit various cancer onset mechanisms. It is also thought to protect healthy cells from radiotherapy, aiding the function of cancer treatments (5). 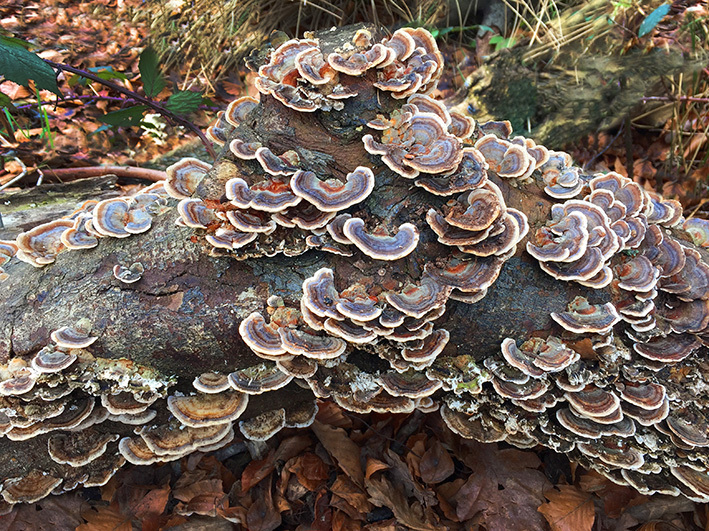 Human trials using Turkey Tail as an adjuvant for conventional cancer treatments suggest that PSK may lessen cancer recurrence rates and improve survival time, particularly in stomach and colorectal cancers (4). PSK has a stimulating effect on the immune system, encouraging the body to produce more immune cells that attack foreign and abnormal cells (cancer) therefore, suppressing the growth of tumours. PSK is deemed to be very well tolerated in human trials with very few side effects. In traditional western herbal medicine, Turkey tail is used for its benefits to the immune system, specifically useful in post viral fatigue and for those people who are prone to infections. It can be taken regularly throughout the winter months to keep immune function in tip top condition, preventing the occurrence of coughs, cold and flu. 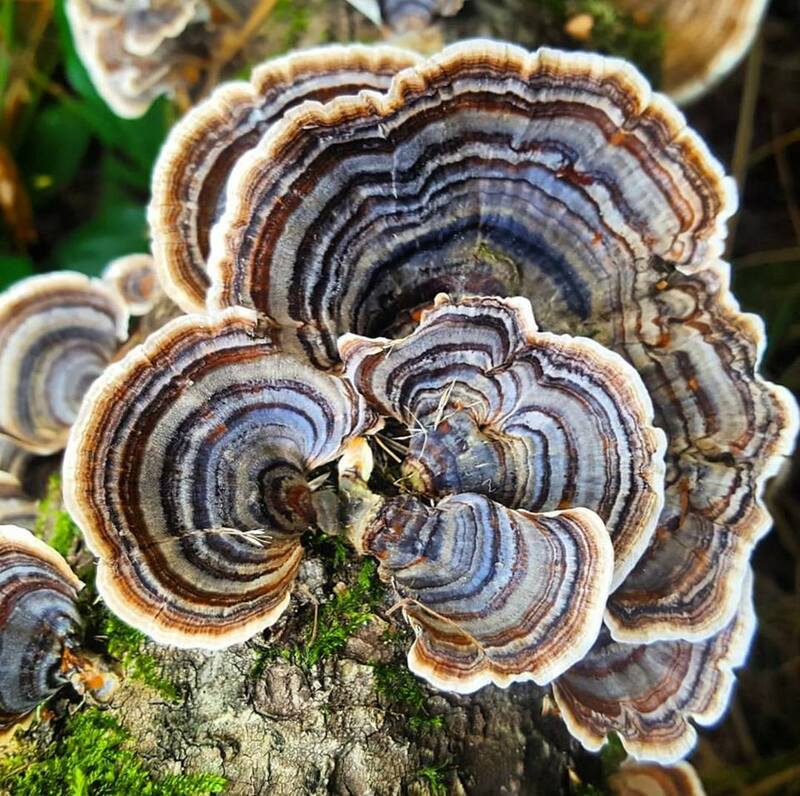 Scientific studies show that turkey tail works by stimulating the immune system, however, the holistic view of this medicinal mushroom (and many others) is that they have an ‘adaptogenic’ effect acting to balance the immune system. Turkey tail has a great mild flavour and can be drunk as a decoction or added to soups and stews. 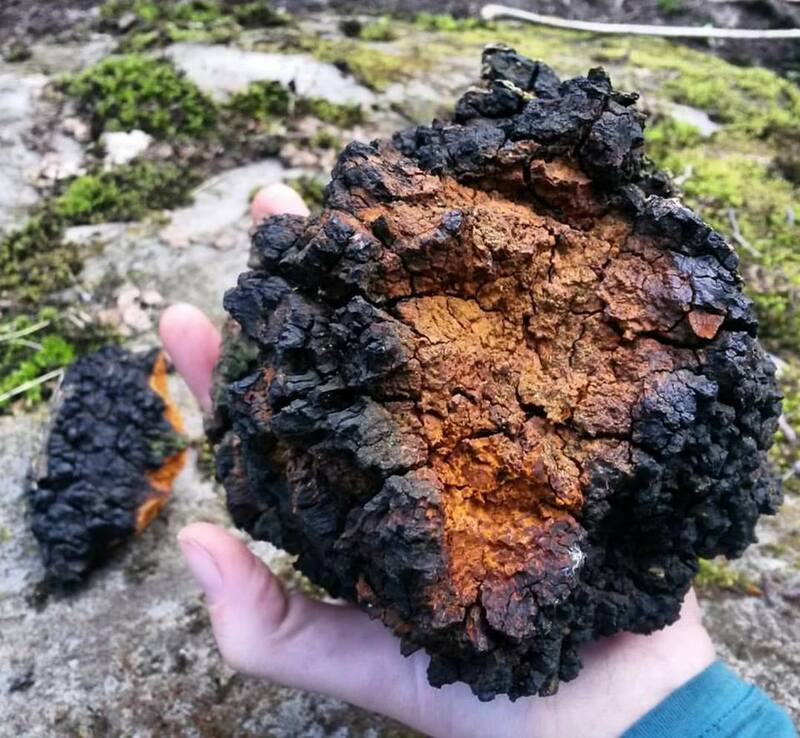 Chaga is another mushroom that grows mostly on Birch, although it doesn’t look much like a mushroom, instead more like a black mass of charcoal or a burl. Many a time in the past when first starting out looking for mushrooms I had been very excited to find Chaga only to find that it was actually a burl. But, once you know Chaga and its patterns of growth, it will be hard to mistake. Chaga usually grows out of the main trunk of the birch tree, sometimes a bit like a tongue, with black cracks that reveal a lighter brown/orange/gold between them. When you cut into the mass it reveals a bright orange-gold centre. You will need a fine saw or very sharp axe to harvest Chaga efficiently, maybe even a ladder as they like to grow high. When you do harvest Chaga it is important not to cut into the wood of the tree as you could damage it, also avoid harvesting at the time sap is rising (usually around February) so that the tree doesn’t bleed sap from any open bark. You are very unlikely to find this mushroom growing in the south of the UK though there have been reports. It tends to grow in the north of the UK, Europe, America and Russia. 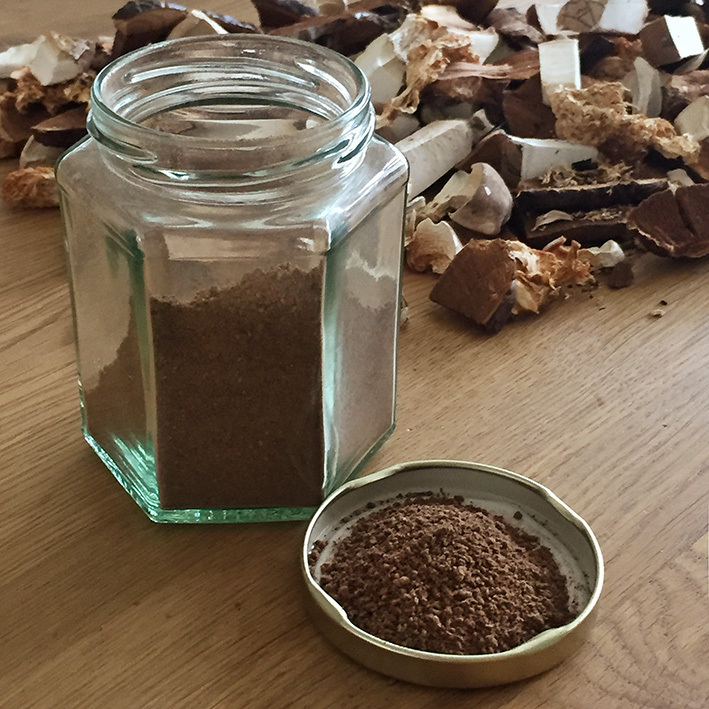 Because of its woody composition, it is important to powder Chaga before attempting to use it for medicine and I find the most effective method for this is to cut it into small chunks with a fine saw or axe and then bash it in a large, stone pestle and mortar. Chaga decoction is a deep brown/black colour with very little flavour, nothing like mushrooms so it can be paired with lots of foods. I like to use it to add colour to black bean stews, chilli, and vegan gravy. In traditional herbal medicine chaga has been used for allergies, inflammatory digestive disorders, infections, cancers and growths. Modern research has shown antitumor (7) antiviral (8) antidiabetic (9) activity in vitro. In animal studies Chaga displayed anti-allergic (10) immunomodulating, anti-inflammatory and pain-relieving properties supporting its traditional use. The medicinal compounds in many mushrooms are bound in tough cellulose structures. 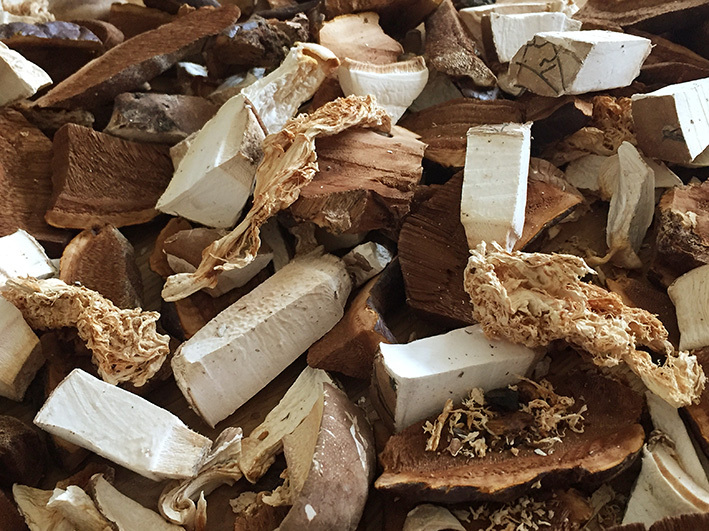 To maximise the medicinal effects of mushrooms and make them bioavailable, these compounds must be extracted first. Outlined below are three ways to extract medicinal mushrooms for use. The simplest way to prepare mushrooms is to make a decoction. A decoction is similar to making a cup of tea, but instead of just steeping the herb, they are made by simmering the mushrooms in water. To make a decoction, place 1-2 teaspoons of mushrooms (for most mushrooms it is best to dry and powder these first, some though can be used sliced, such as birch polypore or shitake), cover with 2 cups of water and simmer for 15-30 minutes. Some of the water will evaporate and this will give around 1 cup of decoction. Strain off the liquid and discard the solids (Although, medicinal mushrooms often have more than just one cup to give, so you can usually add more water and re-decoct for a second or even a third cup of tea). How to use: The liquid can then be drunk by the cup, the usual dose is 1-3 cups daily. Decoctions will keep in the fridge for up to 3 days so it is worth making them in bigger batches. This method produces a very concentrated powder that is much more powerful and bioavailable than simply powdered mushrooms. It does however require a large amount of mushrooms to get any quantity of end product. Start with a large saucepan, fill it half way full with finely chopped or roughly powdered* mushrooms. Then cover with water. Bring to the boil and simmer, uncovered for 1-2 hours. Strain out the mushroom pieces with a sieve (not too fine a sieve). Keep the mushroom pieces – these can be re-decocted for use as tea. Return the liquid back to the pan. Simmer gently until all of the liquid has evaporated, keep a close eye on this process so as not to burn it**. You will be left with one of two things; a fine powder ready to use (yay), or a thick, dark goo. This is depending on what mushroom you use and other factors. If you do get a sticky mess, simply add some rice flour, mix until you have a dough-like consistency and either roll into balls the size of large peas or roll it out as thin as possible then allow these to dry thoroughly somewhere warm. The balls can be used as ready-made mushroom pills or the thin dried sheet can be blitzed up in a food processor. How to use: Keep the powder in a jar to add to soups, stews and other meals as needed. General dose for concentrated mushroom powders is ¼-1/2 teaspoon 1-3 times daily. *You don’t want the mushrooms powdered too fine at this point as when you strain the decoction, very fine powdered mushrooms (with cellulose and other things) will go straight through, resulting in a less concentrated powder. ** If you’re not able to keep a close eye, simmer off as much liquid as possible, then place the resulting gunk in a shallow baking or oven tray and place in a warm place such as over a radiator or by a fire to fully evaporate. Tinctures use alcohol to both extract and preserve. They are a quick and easy way to prepare most kinds of herbs and mushrooms and have a good shelf life of up to 3 years. 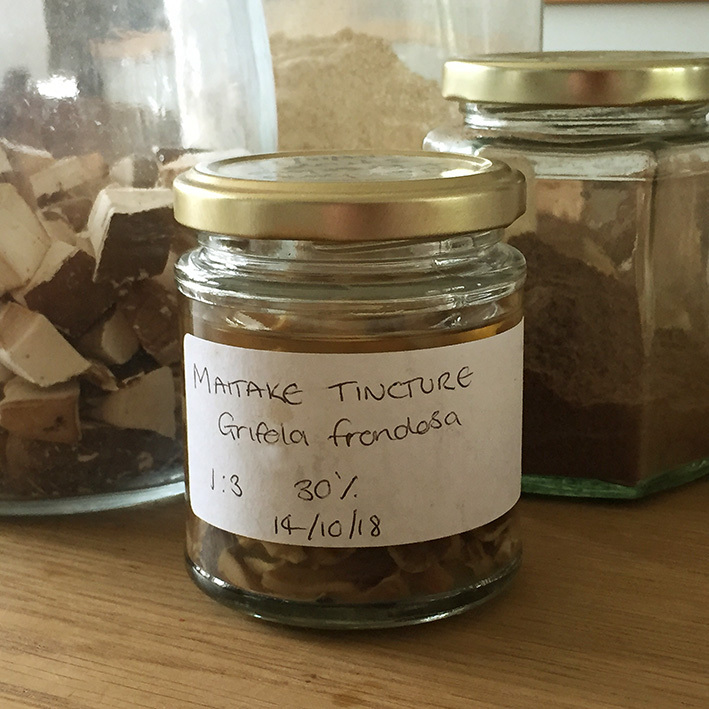 You can make a very simple medicinal mushroom tincture by powdering your mushroom of choice, placing it in a jar and covering with spirit alcohol such as vodka. Or you can go a step further and make a decoction first (my preferred method). So, make your decoction as outlined above, only simmer the decoction down further (you want the liquid portion of the decoction to be really concentrated and not above the mushroom solids). This may take 1-2 hours. Then, strain out the liquid, keeping both the liquids and solids. Measure how much liquid you have and allow to cool. Add 2 parts spirit alcohol (no less than 40% alcohol) to every 1 part decoction. Place the mushroom solids in a large, wide-mouthed jar and pour over the decoction-alcohol mixture. Leave the tincture to sit for 4 weeks and then strain out the solids, discard these. Bottle the liquid, label and date. How to use: The general dose for tinctures is 1-5 mls 1-3 times daily, taken in a little water. (3) Cyranka M et al –. Investigation of antiproliferative effect of ether and ethanol extracts of birch polypore medicinal mushroom, Piptoporus betulinus Int. Journal of Medicinal Mushrooms 2011;13(6): pages 525-33. (7) Ning X, Luo Q, Li C, et al. Inhibitory effects of a polysaccharide extract from the Chaga medicinal mushroom, Inonotus obliquus (higher Basidiomycetes), on the proliferation of human neurogliocytoma cells. Int J Med Mushrooms. 2014;16(1):29-36. (8) Pan HH, Yu XT, Li T, et al. Aqueous extract from a Chaga medicinal mushroom, Inonotus obliquus(higher Basidiomycetes), prevents herpes simplex virus entry through inhibition of viral-induced membrane fusion. Int J Med Mushrooms. 2013;15(1):29-38. (9) Ying YM, Zhang LY, Zhang X, et al. Terpenoids with alpha-glucosidase inhibitory activity from the submerged culture of Inonotus obliquus. Phytochemistry. Dec 2014;108:171-176.